You know its summer in North Texas when the thermometers all read 100 degrees plus for days at a time. 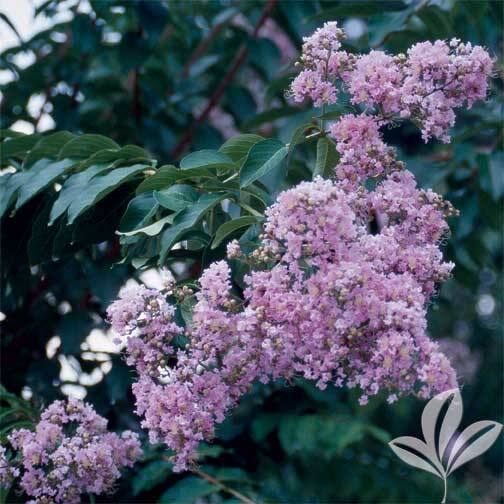 We also know its summer when we see the long lasting pink, red, and purple blooms of everyone’s favorite summer blooming tree the “Crepe Myrtle”. You can count on Crepe Myrtles to bloom from June through the summer months and into early fall. Native to China these spectacular deciduous trees are a perfect addition to almost any landscape. With the right amount of sun and care these beauties will bloom all summer long lasting for years in the landscape. Crepe Myrtles come in a wide range of sizes growing from less than a foot tall to over 100 feet. Crepe Myrtles are classified as Weeping, Dwarfs, Semi Dwarfs, Small Trees and Trees. With colors ranging from light to dark pink, rose to watermelon red as well as shades of white and purple. In addition Crepe Myrtles also display attractive cinnamon colored peeling bark throughout the winter months. 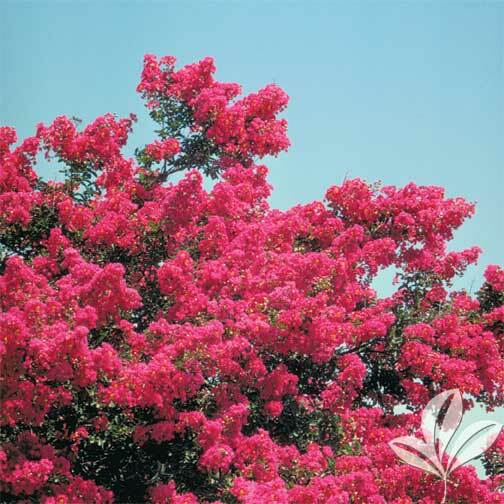 In 1997 the Crepe Myrtle was named “The State Shrub Of Texas”. Crepe Myrtles are among the toughest, most adaptable, and showiest plants that can be grown in the Texas landscape. Along with their bright colorful bloom display during the summer months the leaves of the Crepe Myrtle also turn orange, red and yellow in the fall. 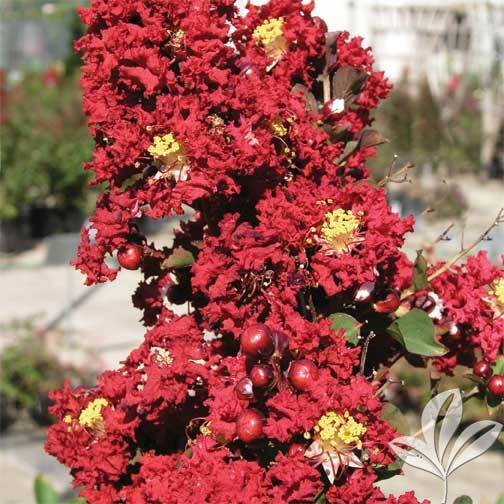 Choose a Crepe Myrtle variety that will best fit the planting site. 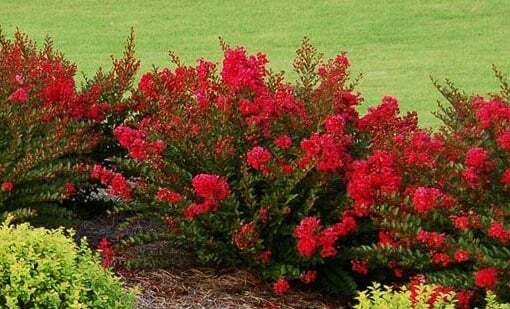 Crepe Myrtles will grow in just about any soil type but will thrive and bloom more profusely in a well-prepared soil. The extra work and time spent preparing the planting site will pay off with a much healthier plant. Dig the hole at least twice as wide as the root ball. It should be planted no deeper than it originally grew in the container. Then backfill with native soil, the same soil removed from the hole. Crepe Myrtle’s require full sun. Plant where they get at least 6-8 hours of direct sunlight. This will allow for the most bloom production through out the summer months. Too much shade will reduce growth and increase problems such as sooty mold and powdery mildew on flower buds and new growth. Crepe Myrtles produce flower buds on new growth. Feed with a high Nitrogen (N) fertilizer. Nitrogen stimulates new growth. Feed just as the new growth begins to appear in late March or early April. Feed again in Late May or early June. Avoid over feeding as this can result in excess growth and a reduction in blooms. 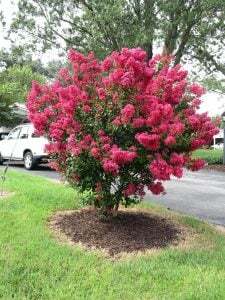 Using a fertilizer that is labeled for Crepe Myrtles, such as NutriStar Crape Myrtles, will give you the best results. Crepe myrtles can be pruned to remove broken or crowded growth anytime during late winter or early spring before new growth appears. Undesirable new growth at the base of the plant can be removed at any time. Avoid pruning in early fall before the first frost as this can result in a flush of new growth that can prevent the plant from going dormant. Plants can be severely damaged or killed by a hard freeze if not completely dormant. Do not cut “large” limbs back! This can encourage an overabundance of new growth near the cut, resulting in unattractive clusters of new growth along the larger limbs. This can also cause them to be more susceptible to insects such as aphids. This type of extreme pruning is often called “Crepe Murder” and is shown below. Crepe myrtles can be susceptible to certain diseases including powdery mildew. Powdery Mildew, shown below, normally occurs in late spring or early summer and again in the fall with warm days and cool nights along with high humidity levels. A white powdery mold coats the young stems and flowers. Preventing the flower buds from opening. Severely infected leaves and buds often drop prematurely. Regular spray applications with Fertilome Triple Action Plus will help to control most fungus and disease problems as well as insects. Sooty mold is caused by the excretions of insects such as Aphids that feed on Crepe Myrtles. The sticky brown or black coating on stems and leaves can easily be removed by rubbing or using a high pressure hose, be careful not to destroy the blooms doing so. Sooty mold seldom causes serious damage but can greatly reduce the health and growth of a plant. Control the Aphids, and the Sooty Mold will no longer be a problem. Spray with Fertilome Triple Action Plus to control Aphids and other insects as well.